Happily for Carillon, justice in Guerdon is often carried out on a cash-and-carry basis. Carillon’s bounty is paid off by Professor Ongent. Carillon, at least, gets out of prison. Spar is not so lucky. Captor Jere is determined to get a confession that Heinreil was behind the destruction of the House of Law. Jere knows that Spar is the more vulnerable of the captured thieves. The disease that gives Spar his durability and strength is terminal. Slowing it requires medicine and Jere controls Spar’s access to the medicine. Outsiders would say that Guerdon is blessed. The cruel old Iron Gods were put down ages ago by the acolytes of the Keeper Gods. The Keeper Gods and their chosen saints keep the peace in the city and the city’s peace with its neighbours. The city’s alchemists have taken magic to unparalleled heights. The Godswar that is reducing other regions to wastelands hasn’t affected Guerdon, other than to provide a market for its alchemical weapons. Guerdon’s inhabitants, on the other hand, are increasingly aware that something untoward is up. The Crawling Ones, monsters not seen since the Iron Gods fell, have reappeared. Carillon is haunted by voices and visions she cannot understand. The peaceful city (a fragile peace when the powerful few rule over the desperate many) is becoming increasingly violent. Violent in new and odd ways. If there is one lesson the Godswar teaches, it is that killing patheons is nearly impossible. The Iron Gods were defeated, not destroyed. That which exists can be called back by those who know how. Someone must be calling. Carillon and company are the key to finding and defeating the call — if they can avoid becoming dangers themselves. This is a first novel and that shows in a few ways. Some info is dumped more than once. There are more viewpoint characters than the author can juggle without losing focus. Still, the characters were engaging. Also, there was an element of caper novel in this debut and I do like me some caper novels. 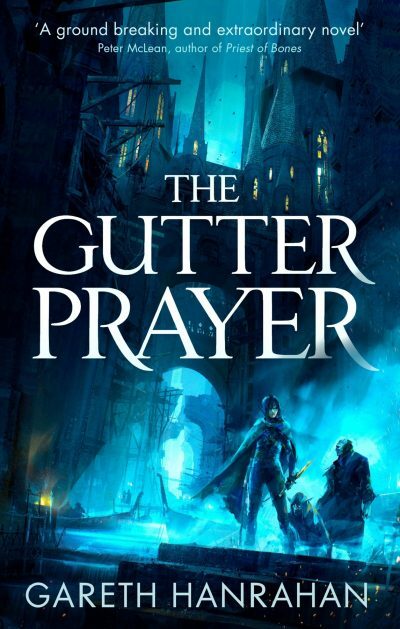 The Gutter Prayer is available here (Amazon) and here (Chapters-Indigo). 1: Given the effects of the Godswar, perhaps the gods are less like steam engines and waterfalls and more like the worst of Soviet-era nuclear power plants.